Sarah E is the winner of last week's give, a nice copy of One Kitten for Kim. Congrats and e-mail me your info to webe(at)soon(dot)com. Thanks all! Sunday, after six hours of arduous on line labors researching,constructing, and editing, I completed a very complicated and difficult post on my own blog (http://mscomfortzone.blogspot.com/) that began with Snow on The Cherrry blossoms, careened through decades of History from 1912 to the present,ending on the Real News of radioactivity in the USA...Today I need to return to innocence like this lovely evocation of crayon art! Love Vera Williams--my favorite is Stringbean's Journey to the Shining Sea. I'm not familiar with Cherries and Cherry Pits, but it looks wonderful. Thanks! I'm not familiar with this title, but we're big fans of More, More, More Said the Baby at our house. Would LOVE to win this one-- an old childhood favourite of mine that I would be thrilled to share with the whole family! This is a book and author that are new to me ~ would love to win. I've never heard of this author before. I stumbled across your blog through an assignment I had in my 'intro to publishing' course, and decided to take a look for recommendations of what to read to my son. I love the site, and am looking forward to more posts! I've linked you as a favorite on my blog. :) Have a great week! Looks interesting! I didn't sign up for last week's giveaway because we already had a copy, but this week's book is unknown to me. Thanks for the chance to win! I would love to add this book to the reading nook in my preschool classroom. I adore Vera Williams! And as a new educator trying to build a classroom library, this would be a wonderful addition. :) Love your blog-- so happy to have discovered it. 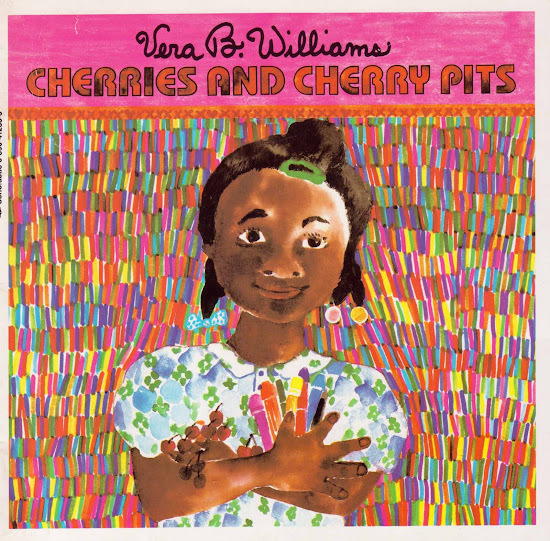 I would love to own a copy of Cherries and Cherry Pits. Please enter me in this giveaway!